In the glovebox of the Tesla Roadster launched on the SpaceX Falcon Heavy is the secret to preserving human knowledge forever - and it comes from a small lab in Southampton. Professor Peter Kazansky of the Optoelectronics Research Centre at the University of Southampton has found a way to store data onto near-indestructible glass that could last for billions of years. With the help of Nova Spivack of the Arch Mission Foundation, they aim to secure human history, art and culture in space for eternity. An exploration of the future of Starman and the Tesla Space Roadster and Elon Musk's future plans for SpaceX. Ancient civilizations, from the Maya to the Indus Valley civilization, used stone and ceramic to keep records. These materials may not be the most efficient medium, but they are certainly durable. Clay tablets from Mesopotamia have survived from the very dawn of civilization. Today, people store most of our records in delicate electronics, which degrade far more easily than the tablets of yore. "Our civilization is more ephemeral, and more at risk, than any civilization we've ever had," Nova Spivack told Space.com. Spivack co-founded the nonprofit Arch Mission Foundation (pronounced ark, as in archive), which provided the quartz discs sent skyward on the Falcon Heavy rocket. Quartz, like glass, is chemically stable and physically durable, Spivack pointed out. Just think of all the glass instruments used in chemistry labs worldwide. And because quartz is transparent, scientists can use high-powered lasers to create patterns within the disc, similar to those 3D crystal engravings you can buy at gift shops. Physically etching data into a disc creates a far more enduring record than using electronic means of encoding data. For instance, the magnetic memory on a hard drive is susceptible to electromagnetic fields, and it naturally decays over time. Transcribing the data within the material, as opposed to on its surface, also provides advantages. It protects information from surface wear, which can kill devices like CDs, where data is stored on the surface. This method also allows for a higher information density, according to the paper describing the technique. Engineers can take advantage of five variables to encode data — each grating's three spatial dimensions as well as two optical properties, called the slow-axis orientation and the retardance. This lets them achieve that impressive 360-terabyte figure. The discs are also a convenient way to send and receive large data packages. Spivack said he envisions humans shooting these high-capacity discs toward distant space outposts to deliver updates from, say, the Earth internet to the Martian internet. The discs would almost certainly offer more bandwidth than radio transmissions do, said Spivack, and physically sending information from place to place is already a widely accepted practice. In fact, Google used this method to transfer 120 terabytes of data from the Hubble Space Telescope between different scientists. Our mission is to preserve and disseminate humanity’s most important information across time and space, for the benefit of future generations. The Arch library that was included on the Falcon Heavy today was created using a new technology, 5D optical storage in quartz, developed by our advisor Dr. Peter Kazansky and his team, at the University of Southampton, Optoelectronics Research Centre. We are so honored that Elon is the recipient of the first 2 Arch libraries ever made. If anyone deserves them, it’s him. Arch1.1 now resides in Elon’s personal library, while Arch 1.2 is enroute with SpaceX to permanent Solar orbit. We also owe a debt of gratitude to our incredible group of renowned advisors, without whom none of this would be possible. We would especially like to thank Michael Paul and Stephen Wolfram for their close support and advice. 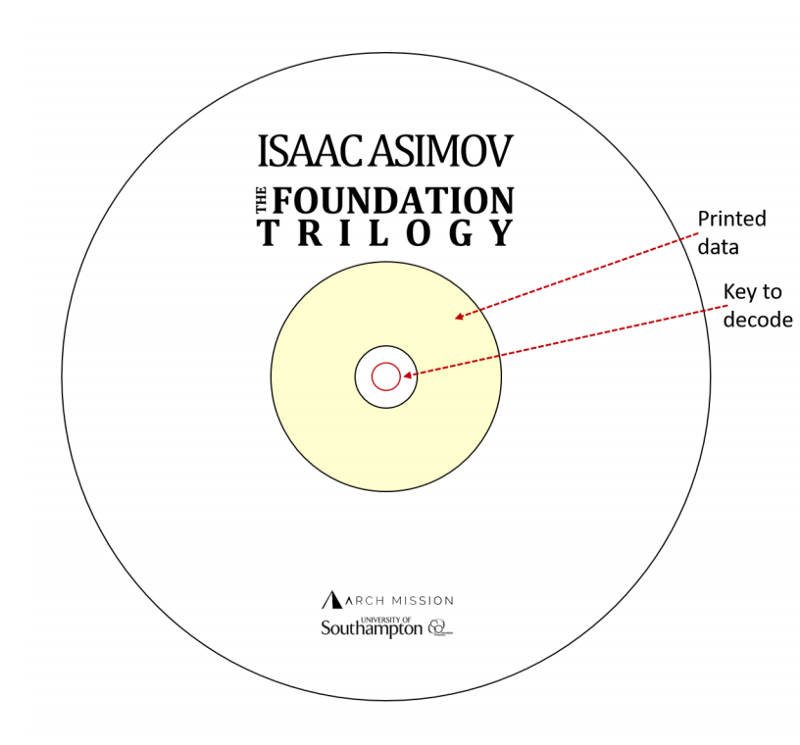 Asimov’s Foundation Series was the inspiration for the Arch Mission Foundation, many years ago when we first conceived of this project. It is a metaphor for what we hope this can become, and it is the perfect cornerstone as our mission begins. For this, we would also like to thank Asimov’s agent, Mel Berger, at WME Entertainment, for giving us permission to send this epic trilogy, to space, as an homage to Asimov’s brilliance and vision. If you are not familiar, Asimov’s Foundation Series is important for its symbolism. The series’ protagonist Hari Seldon endeavors to preserve and expand upon all human culture and knowledge through a 30,000 year period of turmoil. We felt this was a very fitting first payload to include in the Arch. In subsequent Arch Mission updates we’ll add more curated information in more locations around the solar system, and on Earth as well, and using more forms of next-generation long-term storage media as well. This will backup our civilization for eternity in a manner that will make it impossible to ever be lost or not rediscovered, and that will also make it impossible for anyone in the future who does find it to hoard the knowledge — the Arch libraries will be in too many locations for anyone to control access to them. You can read all about our plans on our website, www.archmission.com, but a brief summary is provided here. The Solar Library™ will orbit the Sun for billions of years. We will continue to add to it over time with additional Arch libraries. Think of it as a ring of knowledge around the sun. This is only the first step of an epic human project to curate, encode, and distribute our data across the Solar system, and beyond. We are developing a special Arch library that will be delivered to the surface of the Moon by 2020. This Arch will start the Lunar Library™, a collection of the most important documents, photos, videos and data of our species and will last for as long as the Moon itself. We are also designing an Arch library to land on Mars. The Mars Library™ will be designed to supply a future human settlement on Mars with a vast collection of important knowledge from Earth — including perhaps a copy of a large portion of the Internet. The Mars Library will seed a backup of Earth on Mars, in the event that the connection between Mars and Earth is ever lost in the future. It will also provide colonists on Mars with a massive data set with which to seed a local Internet and Web on Mars. By eventually connecting the Arch Libraries, and the Arch storage devices they contain, through a decentralized read-write data sharing network, that spans the Solar system, we can begin to grow and share a collective decentralized library of everything humanity learns, on every planet in our solar system, and even beyond, as we spread. This truly can evolve into Asimov’s vision of an Encyclopedia Galactica someday — an encyclopedia containing all the knowledge accumulated by a galaxy-spanning civilization. In order to accomplish these lofty goals, we continue to investigate and use a wide variety of emerging storage technologies, and we are funding a few R&D projects of our own too. We are technology agnostic and will continue to use, catalyze, and also develop, the best available data storage and data sharing technologies for our missions. Beyond the benefit of backing up our civilization for the distant future, there are myriad benefits of the Arch Mission today and in decades to come. To start, we aim to inspire and catalyze an ecosystem of universities and startups with a common goal to develop new technologies to collect, distribute, protect, and share human knowledge and data across the solar system. Equally as important, libraries have always been among the greatest artifacts of advanced civilizations on Earth. But sadly many great libraries of the past have been lost. Today’s libraries are even more ephemeral. The Arch library concept is an innovation in the lineage of libraries designed to solve this once and for all. Today’s knowledge exists primarily on paper documents, and plastic media such as magnetic tape, optical DVDs, and flash drives. Paper media, under very carefully controlled conditions, can be kept for hundreds of years, but our plastic digital storage media has a shelf-life of 20 to 50 years. Most of these media are also very vulnerable to heat, cold, moisture, bacteria and fungus, insects, and electromagnetic radiation. To solve this we need both new technologies and a new strategy for spreading and archiving knowledge across a much larger scale than ever before. This is the core idea behind the Arch Mission Foundation’s work. The Arch library is a decentralized library that self-reproduces and spreads across the solar system and beyond, as long as there are humans, and perhaps long after humans are gone. Arch libraries will be spread to as many locations as possible. We will miniaturize them onto ever smaller storage media, with ever greater data capacity until hopefully everyone can have one. The idea here is to make the Arch library as decentralized and indestructible and perpetual as possible. In doing this, we employ strategies learned from nature itself. Even though some parts of the Arch library may eventually be lost, the library itself will replicate them — almost like a hologram on a vast solar system wide scale — so that it will never be lost. The first Arch Library is being deployed by SpaceX into a Mars orbit around the Sun for at least millions of years. We call this The Solar Library. It’s a small test library, using a new way of storing data in quartz. For you comic book and superhero fans out there, our quartz Arch library disks (one of which was onboard the Falcon Heavy) are a lot like Superman’s Crystal of Knowledge, which was used to create the Fortress of Solitude. These Arch disks are written by a femtosecond laser on quartz silica glass. Data is encoded digitally using plasma disruptions from the laser pulses. You can learn more about this process here and here. This new medium, invented over decades by Dr. Peter Kazansky, is expected within 10 years to achieve a storage capacity of 360 Terabytes per 3.75 inch disk of quartz (that’s 7000 Blu-Ray Disks! ), and is stable for at least 14 billion years, under a wide range of extreme conditions. Today this is the best way to store data for billions of years in space. These first Arch libraries are very simple tests, but we have given a lot of thought to how to make future Arch libraries more accessible and understandable to potential recipients. It is also important to note that quartz is just one of the storage media that The Arch Mission is working on. It is also possible to store an incredible amount of data for a really long time in other media for example non-living DNA. We’ll reveal more about this work soon. You can read more in our FAQ, as well as in this very thoughtful blog post by Arch advisor, Stephen Wolfram, about the unsolved hard problems to think about. Wolfram explains the deep challenges in communicating knowledge across species and great distances of time. This is a very interesting topic for debate and further research and development. From our perspective, despite the philosophical and technical questions, we know that we have to try — and that by trying we will make discoveries that we cannot yet imagine. Furthemore, as Wolfram points out, whether or not future beings can understand who we humans of today were — it’s important to try. The Arch libraries are monuments that inspire us today, and may inspire and inform others in the future for thousands to millions of years, or longer. We can think of them as gifts to the future. But if by doing this, we also succeed in transmitting our knowledge across the ages, to distant recipientes we cannot yet imagine, then all the better. The Arch Mission’s next operational goal is to fundraise an endowment. Please help us by making a tax-deductible donation to the Arch Mission Foundation, the registered not-for-profit organization we formed for this purpose in the USA. We will need to raise a lot of money to fund our missions over time, but any amount helps. Ultimately we hope to raise an endowment that can sustain the Arch Mission Foundation perpetually, long after we are gone. A large base of donors is equally important to maximizing societal impact. Payload space on rocket hulls or satellites other objects that will be delivered or discarded to long-term locations in space. Ancient civilizations accomplished this by preserving their data in stone, a very long lasting medium — for example, The Pyramids of Giza. As well as backing up our civilization against the threat of human-caused or naturally-occuring planetary disasters, there is another reason to build Archs. Archs are important in facilitating the transition to a spacefaring civilization. To truly graduate to a spacefaring civilization, we need to develop storage media and technologies to transmit vast collections of our knowledge, in very small and lightweight objects, that are durable under the harsh environments of space and the surfaces of other planets. That is, the Arch libraries provide a way to send big data sets into space, alongside humans and human colonies, wherever they may go. And along the way? We think that the Arch Mission can help to inspire and galvanize broader participation in the next next great leaps civilization endeavors to make. Everyone has knowledge and wisdom to pass down, and everyone can participate in the Arch Mission — including educators, students, parents, kids, content owners, corporations, non-profits. Thank you for your support and your enthusiasm. Today was a big day not just for the Arch Mission Foundation, but for all of us.